Love what we're doing? Tell your friends all about it! You would be surprised how many people receive fresh flowers but have nowhere to put them. I also have the same problem. I’m forever roaming the cupboards looking for something acceptable to put my flowers in. You would think a florist would own heaps of vases, but no, no I don’t. I have plenty of buckets! Old Italian tomato cans – I love the labels on them and I think they contrast beautifully against the flowers. They are a little quirky and fun. Mineral water bottles – there are so many cool (and rather expensive!) brands of mineral water these days so instead of throwing away that $5 bottle of Antipodes use it to put your flowers in. Even a little bit of greenery looks great in them! Water jug – maybe not super hygienic if you are going to drink out of it after flowers have been in it but desperate times call for desperate measures! Either way I love a good jug of flowers. At the moment I have Chestnut stems in my pale pink jug and they look great. Old jars – jam jars, vegemite jars, any old jars will do. Empty candle jars – flowers always look great in these. Teapot –flowers in a teapot is great for achieving a vintage look. 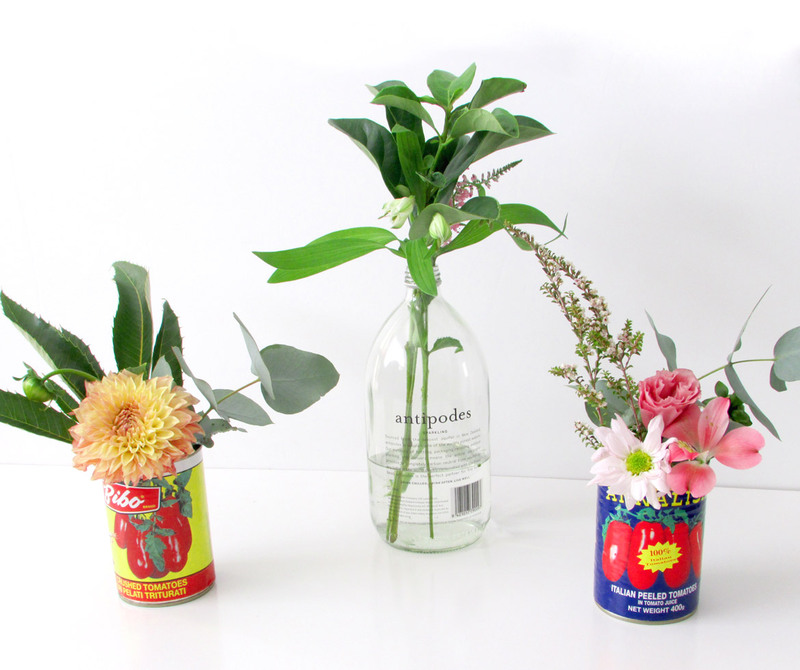 Once you have found something to put your flowers in have some fun with arranging them! Don’t take it too seriously! Step outside and see what’s hanging over your fence (I’m not encouraging you to steal here) and take a few cuttings and see what you come up with. Sometimes just a stem of green foliage looks great! Copyright © The Flower Run. All rights reserved.